Welcome to the (small) Yorkshire Terrier world. Whether you have lived with the breed before, or are simply looking for your first Yorkie, then there is no going back now. In all honesty, and over so many years of working with the Yorkie, I have never known anyone who lived with a Yorkshire Terrier not to completely fall in love with the breed. 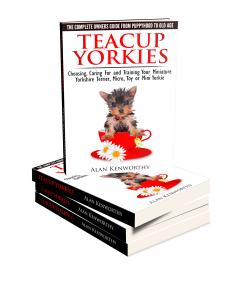 I wanted to write this guide dedicated to the tiniest Yorkshire Terriers out there because they are a character all of their own. Their bold heart and constant dedication will earn your respect and loyalty. As an established dog trainer, I want you to find the healthiest little dog, know how to look after him perfectly, understand his behavior and the best way to train him. You will find all that information, and much more, here, so please read on and enjoy. Thank you to CWP Publishing, our publishers. Hi, im looking to adopt a puppy tea cup female. my story id heart breaking as my puppy 5 months old passed away during her surgery a simple spaying procedure and she never returned to me . im still upset and it hurts that she was only a baby please if you have it in your heart to get back to me i would really appreciate that have a wonderful night . I really want one of these puppies!